Amazon Echo highlights, in a series of new ads, that you can set reminders, play music, control smart home devices, and more with the Echo Dot. One of them, titled “Knot Today”, features a man who is reminded to put up the Christmas lights. 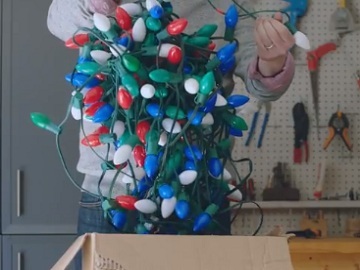 Going in the garage and taking them out of a box, he finds them all tangled and, since he is not in the mood to unravel them, asks Alexa to remind him put up the lights tomorrow. “Ok!” – comes Alexa’s answer. This hands-free, voice-controlled device, available for $49.99, uses Alexa to do many other things and help you throughout the day with multiple tasks. These features are showcased in other Christmas-themed spots part of the “Amazon Alexa Moments” campaign, aiming to highlight that you can make your holidays even more magical using Amazon Echo.